The UK Home Office has refused to be drawn on demands to extend the proscription of Islamist militant group Hizballah but said it “acknowledged” the fresh calls to do so. 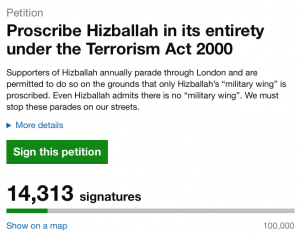 Almost 15,000 people have backed a campaign to proscribe the Lebanon-based Shi’a Islamist group which has called for the extermination of Jews and is responsible for murdering and maiming British soldiers. At present the British government only proscribes the “military wing” and not the “political wing” despite the organisation having only one flag and openly ridiculing any distinction between the two factions. And in a confusing and somewhat contradictory statement from British Home Secretary Sajid Javid’s office, the government outlined that “wearing clothing or carrying articles in public” that invite support of a proscribed organisation could be an offence under UK law before admitting that the yellow and green AK-47 Hizballah flag was a symbol of both the so-called military and political wing and that “context” was important. The petition is being spearheaded by volunteer-led charity Campaign Against Antisemitism and has been signed by people from all corners of Britain with outspoken Imam Tawhidi and retired British Army officer Col Richard Kemp also voicing their support. To view the petition, visit this link.